When we protect your filter purchase with our No Worries Guarantee, we mean it! Your filters are guaranteed to be the right fit! Our products are price match guaranteed! Our customer service team is guaranteed to answer your call! Youâ€™re guaranteed to find expert help! Have you noticed white buildup on your faucets? Do you have chalky residue clouding your glassware? Do your sinks or appliances seem sluggish? Does your soap barely lather in your shower, leaving your skin dry, and your hair limp? Does your laundry never feel completely clean? If so, you may be dealing with hard water – and you’re not alone. The U.S. Geological Survey says 85% of homes, more than 250 million U.S. residents, have hard water. 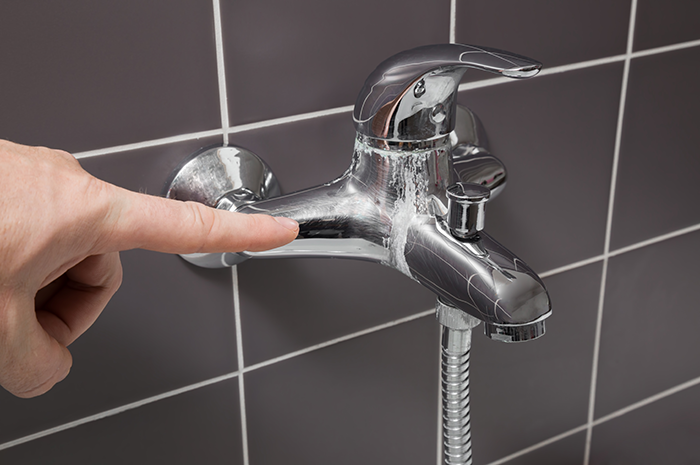 Hard water reduces the life of your pipes and appliances and can damage your clothes and skin. 85% of Americans suffer from the effects of hard water. Search your zip code below to discover the level of hardness in your area. from EPA water quality samples in your area. How many Grains per Gallon (GPG) do you have? GPG: Grains per Gallon is the industry standard unit of measure for the amount of hardness in a given water source. All of the above symptoms require more soap, more shampoo or more scrubbing for you and your family. But, it's not all bad news! How do I treat Hard Water? How do I choose a solution that is right for me? For your reference, we have also included a brief FAQ section. For additional questions or concerns about Hard Water or any other Water and Air Filtration conditions or products, feel free to contact our award-winning Customer Service Team at Support@DiscountFilterStore.com or 1-800-277-3458. Quality systems at great prices. Water that contains a high amount of dissolved minerals is considered “hard”. It is often the result of ground water collecting calcium and magnesium as it rises through limestone. The higher the mineral content level, the harder the water. 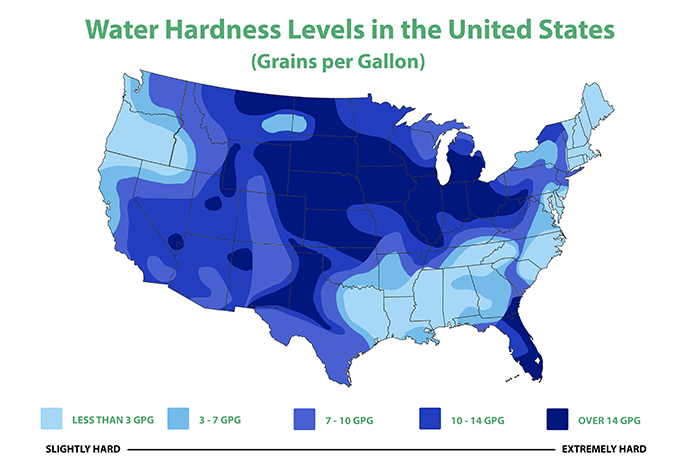 Hard Water is typically measured in grains per gallon (GPG) and hardness varies across the country. Even if you don’t live in the “very hard” or “extremely hard” water zones, you may experience the effects of hard water. Hard water reduces the effectiveness of soap. While in the kitchen or bathroom, one may notice soap is not as effective. Instead of fully dissolving, some soap combines with the minerals in hard water. Because less soap is dissolved, you may use more to try to get “clean”. Undissolved soap may still cling to your skin or hair leaving it dull and lifeless. Similar symptoms can occur when using laundry detergent. Undissolved detergent can keep dirt trapped in cloth fibers resulting in stiff, rough-feeling fabric. Soap deposits may also leave spots on everything you wash - from dishes to cars. Soap film may build up in high usage areas, creating a potential haven for bacteria. Minerals from hard water may also leave scale deposits; chalky, plaster-like buildup on faucets, appliances, sinks and bathtubs. Mineral deposits can build up in pipes, reducing water flow and raising water bills. As the flow is restricted, lime-scale build-up accelerates. 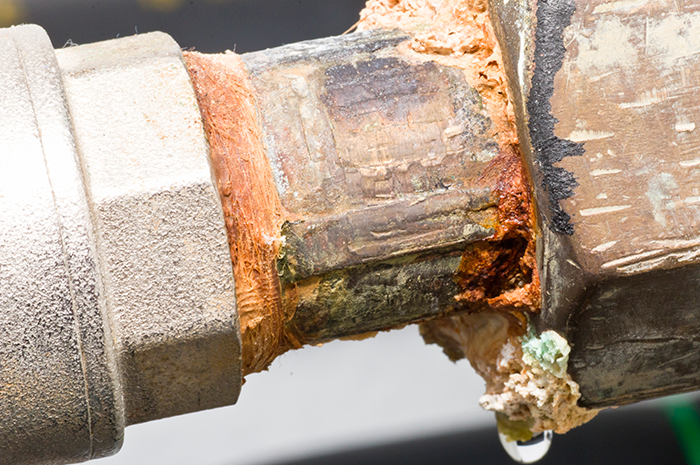 Obstructions can damage pipes and clog appliances leading to loss of efficiency. This may also lead to expensive repairs or replacements. According to a 2009 study commissioned by the Water Quality Association, or “WQA”, the impact of hard water on household appliances and fixtures can take years off the life of dishwashers and washing machines. 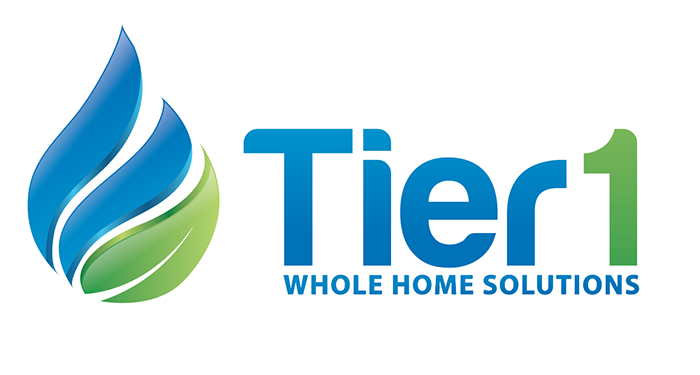 For high efficiency appliances, energy savings may decrease dramatically. Warranties for some high efficiency models may be voided if used with hard water. For hot water heaters, whether gas, electric, or tank-less, they won’t last nearly as long or run efficiently. Running hard water through hot water heaters cuts efficiency by up to 48 percent, with scale buildup shortening the lifespan of the heating elements. If you suspect you have hard water or you’d like more information on its causes or symptoms, you can find additional resources at the EPA Office of Ground & Drinking Water-Local Water Report. If you have a well or live in an area not listed, you can purchase a water test kit and test it yourself. There are two primary options for addressing hard water: water softeners, and water conditioners. 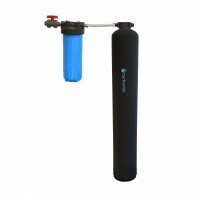 Salt-based water softeners remove minerals from your water, while salt-free water conditioners prevent the minerals from adhering to your pipes and appliances. 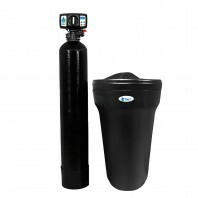 A traditional salt-based water softener system is comprised of a mineral tank and a brine tank. It is typically installed in a plumbing system at the point that water enters a home. This can also be referred to as “Point of Entry” (potential link). Using a process called ‘ion exchange’, the softener trades the hard water minerals for sodium. The mineral tank is filled with small polystyrene beads, also known as resin. The beads carry a negative ionic charge. 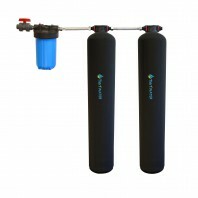 The primary minerals in hard water, calcium and magnesium, both carry positive charges. These minerals cling to the negatively charged beads as the hard water passes through the mineral tank. The brine tank uses common salt (sodium) to create a brine solution. Sodium ions also have positive charges, but not as strong a charge as either calcium or magnesium. When the brine solution is flushed through the system tank it comes into contact with the polystyrene beads, now saturated with calcium and magnesium. Once the beads are saturated, the unit enters a 3-phase regenerating cycle. First, a “backwash” phase reverses water flow to flush dirt out of the tank. Second, a “recharge” phase carries the concentrated sodium-rich salt solution from the brine tank through the mineral tank. The sodium collects on the beads, replacing the calcium and magnesium, which are flushed down the drain. Lastly, the mineral tank is flushed or “regenerated”, eliminating excess brine and the brine tank is refilled. 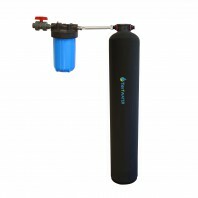 Most popular water softeners have an automatic regenerating system. The most basic type has an electric timer that flushes, recharges or “regenerates” the system on a regular schedule. For those on sodium-restricted diets, the sodium remaining in softened water may be a problem. 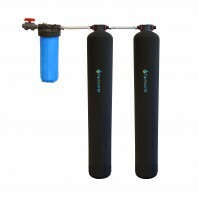 One solution is to install a separate water dispenser that bypasses the softener. You could also use potassium chloride instead of salt, although this costs about three to four times more. The discharge of salt brines from the regeneration of water softeners can have a negative impact on the quality of water in groundwater basins, recycled water, and wastewaters. Higher sodium and chloride content increase treatment costs and reduce the potential reuse of wastewater for farming and industrial applications. It can also impede the ability of a wastewater treatment agency to comply with discharge standards related to total dissolved solids (TDS). Because most wastewater treatment facilities do not remove measurable mineral concentrations from the waste stream, they are passed on to the environment. As a result, a small but growing number of municipalities no longer allow the use of salt-based water softeners. While salt-based water softening removes hard water minerals, the salt-free process (also called water conditioning) does NOT remove hardness minerals. However, it changes their form. Water Conditioners process water through a catalytic media using a physical process called Template Assisted Crystallization (TAC). The hardness minerals are converted to a crystalline form, creating a “hardness crystal”. These crystals cannot bind to surfaces, such as the insides of your pipes or appliances. This method is not as effective as salt-based systems, and will not work as well when exposed to high levels of hard water. If you want to address issues with hard water in your home, the first step is to assess your current water, either from your municipal water report or by testing the water yourself. 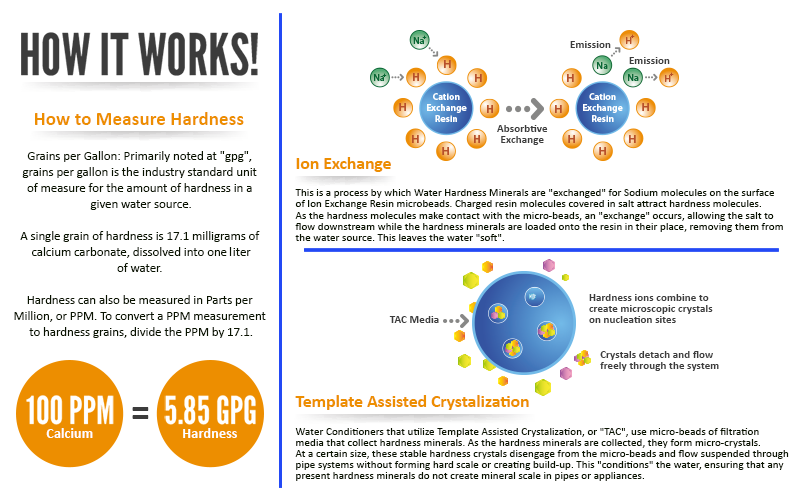 Salt-Based Water Softeners remove “hardness” minerals. 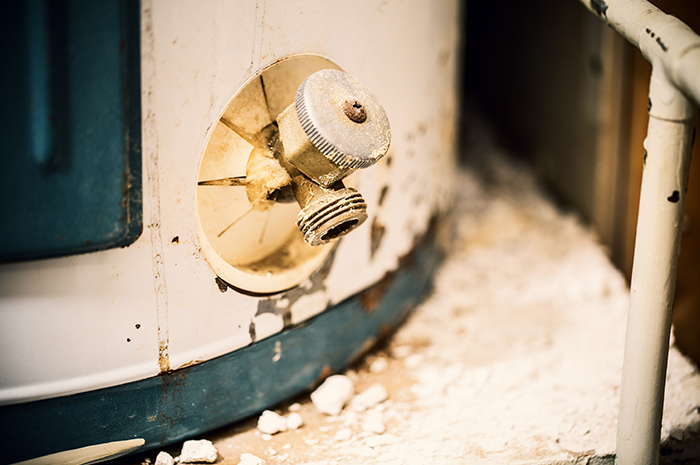 If hard water levels are high, a salt-based water softener may be a better choice. However, some municipalities don’t allow salt-based water softeners. Salt-Free Water Conditioners leave hardness minerals present in the water. Scale build-up is reduced and salt usage is avoided. One may see less soap usage and brighter laundry. Salt-free water conditioners will address medium and low hardness situations effectively. DiscountFilterStore.com offers a selection of Salt-Based and Salt-Free Softening and Conditioning options. Those products can be found here. For more guidance on choosing a solution that will meet your specific needs, please contact our Customer Service Team at Support@DiscountFilterStore.com or by phone at 1-800-277-3458. © 2018 DiscountFilterStore.com. All Rights Reserved Worldwide.